In August 2009 I posted a photo which showed a way of featuring kid’s drawings (you can read this post here). I did not have any children back then but now I have a baby son I can’t wait until he is old enough to make me some beautiful drawings! I also like the way how drawings are displayed in the image above. Great inspiration! 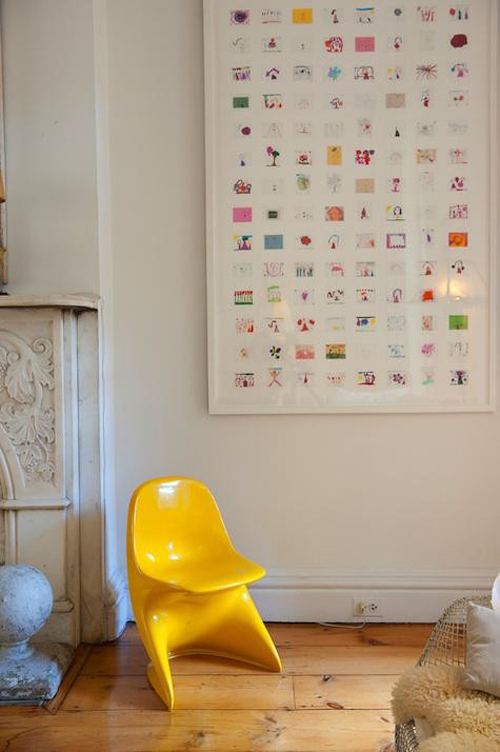 I’m also loving that gorgeous yellow vintage chair. Wat een mooie strakke oplossing voor kindertekeningen! Children encouraged to create art are so much more self confident at an early age! Come and join my gorgeous Giveaway from Splenderosa! wow i love all your gorgeous pics! so inspiring! im happy to have just found your blog! So nice to get inspiration for incorporating life with kids—great example of how the two aren’t mutually exclusive! It is strange that your blog has not caught me before, thanks for the article.